A new article related to Myotonic Dystrophy Type 2 research was published in September 2017 from the lab of Dr. Laura Ranum. 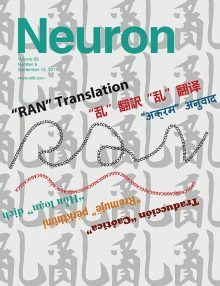 The findings were reported in the journal Neuron and was featured on the cover of the journal. The work was spearheaded by Dr. Tao Zu and is entitled “RAN Translation Regulated by Muscleblind Proteins in Myotonic Dystrophy Type 2”. Click the cover below to download the article.